Scientists fear that California's water supply is under threat by a practice that has been banned in every major oil-producing state. California allows oil companies to dump millions of gallons of wastewater into open, unlined pits across the state. Investigative Reporter Stephen Stock reports. Fred Starrh’s family near Buttonwillow, California, used to have good, clean water under their land which they could use for their crops. Starrh said that was before oil companies next door started dumping their waste into open, unlined “percolation ponds” near the Starrh farm. Fred Starrh says oil company Aera Energy destroyed his family farm's water. Aera is owned by ExxonMobil and Shell. The Starrh family sued the owner of those waste ponds, Aera Energy, a company owned by both ExxonMobil Energy and Shell Global, charging that Aera destroyed their fresh water by polluting the groundwater under the Starrh land through the continuous use of those open waste pits next door. The practice of dumping wastewater from the recovery of oil into unlined, open pits is one that has been banned in nearly every other state in the U.S. But in California, oil companies can legally dump toxic waste onto the bare ground, into what are called “percolation ponds.” The waste comes from oil drilling, which requires an average of 12 gallons of water for every gallon of oil that is produced, according to the Central Valley Regional Water Quality Control Board (CVRWQCB), which oversees open dumping. When it comes up out of the well, scientific tests and a staff report from the Water Board show the wastewater can contain toxic chemicals such as benzene, xylenes, ethylbenzene, boron, strontium and toluene. According the CVRWQCB’s incoming Executive Officer Patrick Pulupa, there are at least 1,086 active wastewater ponds stretching from Monterey to Kern County. NBC Bay Area’s Investigative Unit found even more active ponds that are not on the board’s list. “Astonishingly, California is the only oil producing state that allows this reckless practice,” said Hollin Kretzman, a lawyer with the Center for Biodiversity. Officials in Texas say state leaders there banned this practice in 1969 after hundreds of reports of contamination to groundwater. Other states require a barrier at the bottom of a waste pond to protect groundwater below. Only New Jersey allows open, unlined wastewater pits like the ones in California, and New Jersey does not produce oil and gas at the levels of states such as California, Texas, North Dakota and Montana. “It’s very concerning that the contamination is spreading underground to groundwater,” said Kretzman. 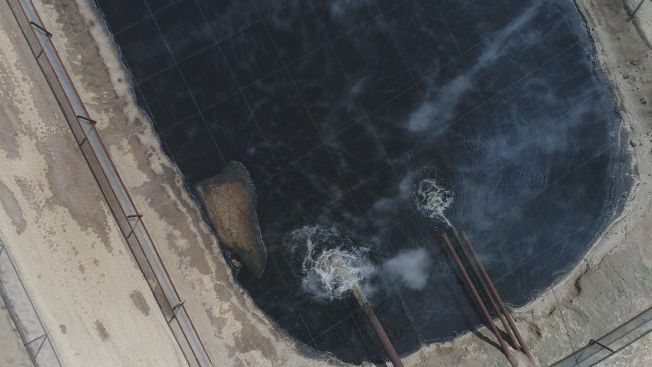 In just one series of ponds, near the small community of McKittrick, in Kern County, California, NBC Bay Area found that oil drilling operations are dumping as much as 4.8 million gallons of wastewater per day during peak periods. The ponds are owned by the Valley Water Management Company, which manages wastewater from oil drilling operations. Oil companies contend that the toxins in the wastewater are filtered out as the water seeps into the soil, but a report by the staff at the Central Valley Regional Water Quality Control Board concludes polluted water has migrated underground 2.2 miles from the wastewater ponds in one instance and more than a mile in another instance. “It’s increasingly likely that these pits can contaminate groundwater,” said Dr. Seth Shonkoff, visiting scholar at UC Berkeley’s Department of Environmental Science, Policy and Management and executive director of PSE Healthy Energy in Berkeley. Shonkoff is an epidemiologist and environmental scientist who has been researching the water and health issues for more than 15 years. He’s concerned that California’s current policy of allowing this kind of dumping in open pits jeopardizes water supplies that the state will need during future droughts. The agency in charge of regulating many of the ponds is the Central Valley Regional Water Quality Board, which oversees a large swath of California from near the Oregon border down to Kern County. Any company that is discharging waste in a way that could impact water quality needs to get a permit from the water board. Pulupa admits the agency has “to be totally honest." It’s estimated it would take $2 billion alone to clean up the toxic waste that now sits under the Starrh family farm. "As a California company, Aera takes protecting the state’s natural resources seriously and works to meet and exceed program expectations established by the U.S. EPA, State Water Board, Regional Water Quality Control Board and DOGGR to ensure the protection of groundwater quality. In addition, water monitoring networks have been established at our production facilities, and we follow prescribed monitoring and reporting frequencies." With regard to the lawsuit from the Starrh family, Aera said, "The facts are that after years of litigation and three jury trials, there was never a finding linking Aera’s operations to damage to tree crops or harmed drinking water resources. The case was finally settled to avoid further expense and the distraction of more protracted litigation." But in reviewing court records, the Investigative Unit found a verdict from the first jury trial in the Starrhs' case, stating that Aera Energy had “intentionally, recklessly or negligently caused oilfield produced water to enter the subsurface and native groundwater beneath” the farm. Aera Energy appealed that verdict. And there were two more trials that also were appealed. The appeals stretched on for 13 years, and finally the Starrhs settled the lawsuit for an undisclosed amount. Larry Starrh saves much of his frustration and ire with the situation for state and local regulators more so than even the oil and gas companies.